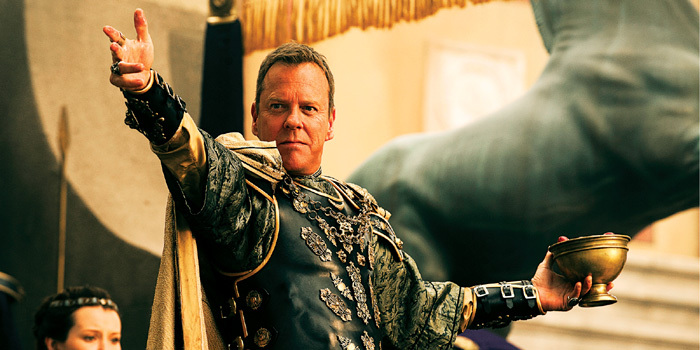 HE HAS played Counter Terrorist Unit (CTU) agent Jack Bauer with panache in 24, doting father and former journalist Martin Bohm in Touch, and now Keifer Sutherland returns to the big screen in Pompeii. The actor, who plays the humorous but evil senator Corvus, alongside Kit Harrington of Game of Thrones, tell us what goes into a period drama and being directed by Paul Anderson. Your role as Senator Corvus. Hea��s the antagonist of the film, but ita��s very different. Hea��s very funny, in an awful way. With a class system like you had at that time, if someone was wealthy and powerful, the ease with which they dispatched other peoplea��s lives was kind of frightening. He does it with great aplomb. I havena��t really had a character to play that has had dialogue that is as rich as in the script, so ita��s been a real pleasure. Ia��ve been doing this my whole life. I started riding horses when I was about 16, 17 years old. I rode them in Young Guns. I rodeoed on the USTRC circuit with the National Finals of 94/96, so horses were really familiar to me. The chariot was not. I did extensive training for Three Musketeers with fencing, so I had to step up with the sword play in this. Obviously with 24, there was unbelievable physical combat. Nothing is unfamiliar. Ita��s a question of learning the specific dance for this film. Each battle sequence is a dance. Do you relate to this character at all? The shape of the character for me is what I relate to in the context of the story and how much fun I can have with that part in the balance of what hea��s doing and what shea��s doing and so forth. So no, ita��s not that kind of character where I have to have some kind of deep emotional or intrinsic connection. He commands a set with absolute authority. Hea��s so technically proficient that Ia��m not even aware wea��re shooting a 3D movie. That is a real testament to him and his crew that have done this before and know how to do it. But as nice as he is, hea��s very clear about what he wants. Therea��s a real safety in that. Again, I can push this direction all I want, but hea��ll pull me back and make sure Ia��m fitting into the context of this film. Ita��s just one of the most comfortable environments Ia��ve ever been in. Returning to television with 24. The studio has been getting a lot of mail about wanting the show back. Howard Gordon had an idea, in case we were going to do a ninth season. He honed it down to 12 episodes and finally just said, a�?If you guys really want to do this, Ia��ll do it.a�? He called me up and pitched me the idea and I was like, a�?Thata��s really cool.a�? Ita��s a great group of people, so Ia��m thrilled to come back to work with them. Pompeii is scheduled to release today.